Fuel Tank Sizes To Be Over 25% Bigger Than All In Every Category. Bigger Tanks Mean Longer Run Times; 12-14 Hours On Every Gen Without Refueling! These Generator Perform Everywhere It Counts - Bigger Power, Larger Runtimes, & An Industry Leading 3 Years Warranty. Firman Hybrid Dual Fuel Generators - the new standard in power generation & exceptional performance. The W02981 is an inverter generator, having low THD (clean power for electronics and sensitive equipment), quiet operation and fuel-efficient economy mode. 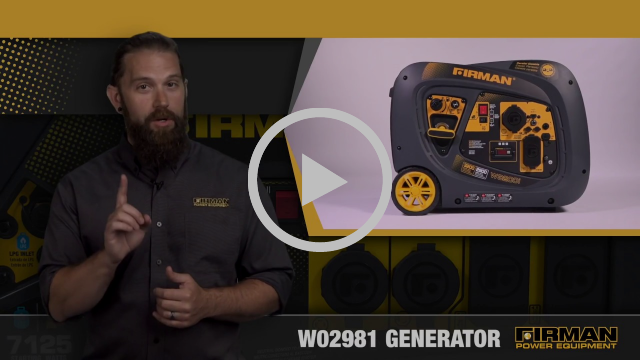 This generator features 3200 starting watts and 2900 running watts, with a reliable recoil start system. From your Friends at FIRMAN, with Love!